Oh dear, it's been over two months since my last post. Time really does get away from you when there's a little one at home! I am very pleased to report that I have completed two races since my last post, and I have one coming up soon. I regret not writing a race report after each of the last two races, so I will do my best to recap here. My next race will be the April Fool's Run that I do every year on the Sunshine Coast. Because of my history there and my relationship to that race, I will do my darndest to write a blog post after that run as quickly as I can. My apologies to my social network that would have appreciated more timely reports on my other two races. The first of the two races was the West Van Run 10K on the first weekend of March. I love this race and this was a must-do event because of my friendship with the race director and my membership with the West Van Run crew. This race was my first 10K completed post-partum, and it was a "big long run" type goal. It was quite fitting that this event was my return to racing post-baby because of the way it book-ended my pregnancy in 2017. 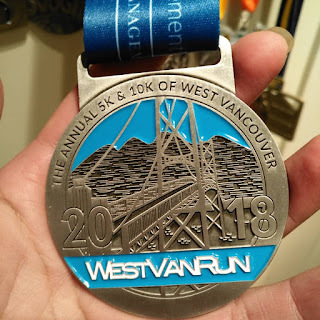 The West Van Run of 2017 was my first race after learning that I was pregnant, and its sister event, the North Van Run, was my last run completed during my pregnancy at 37 weeks. My daughter was born 2 weeks after that race, and I set my eyes on the West Van Run as a goal to achieve in 2018. I did it, but it wasn't easy. It wasn't easy because it was indeed my longest run completed post-partum. I had intended to complete the distance at least once in my training but things got in the way such as the flu, a lingering cough, and an unexpected snowstorm! But I had done 8km a few times and knew I had it in me to push a little further on event day. It was also not easy because of sideways rain that day! And I also had a very tough night the night before the race after a very difficult day before. This is what happens when you're a new mom - sometimes you have an insanely hard day. I LOVE being a mom and I feel so incredibly blessed to be experiencing this journey and to have my beautiful daughter in my life. There are some elements though of motherhood that are challenging mentally, physically, and emotionally. And that is putting it very lightly. I do not feel like publicly detailing the challenging day that I had, but it was ugly and I could not sleep after all the negativity and many many tears. In fact, I almost skipped the race entirely because I didn't feel like I could fake a smile when I would bump into my friends. But this race was a goal of mine and I knew that not doing it would make me feel worse. I had to show up and prove to myself I could do this. And so I did. And it was hard. And when I got to the finish line and saw my loving friends there cheering, I burst into tears. I was so very very embarrassed too for my emotional outburst, but my friends were so full of love and understanding. Thank you ladies! I avoided seeing other friends, especially those with cameras, and dodged nearly all small talk. I avoided socializing. I avoided all the things I normally would do after a race and I promptly returned home. Running did make me feel better about the situation I was upset about, and don't worry, it's now all completely a thing of the past and I am just fine. And I have this bad boy in my possession! My finish time has long been forgotten and it's nothing exciting to report on. It was my 2nd slowest 10K race (I was slower when I ran the Eastside 10K at 35 weeks pregnant, of course). The race was organized impeccably and it was great to be out there. Thank you to Kirill and all the amazing volunteers for the hours of work put into making this event happen. Hope to be back for the summer event in June! And as per tradition, I ran the St. Patrick's Day 5K again this year. This year the event fell on St. Patty's Day itself which made it that much more special. This was a bit of a spur of the moment decision to run because I saw that my husband had the day off work so his help with our daughter that day was available. I didn't want to make demands of his time so soon after the West Van Run, but of course, he was happy to take on a morning of parenting alone since he was freed up that day. So I contacted my sister in law, with whom I have run this race the last few years, and we made a plan to run together. And I know the race directors for this event too and was given the Running Room staff code to make the race even more affordable and a no-brainer to complete. This race was, as always, a blast! My friend Monica ended up running the whole race with me, which was a lovely surprise. Michele was feeling particularly speedy and good and we didn't hold her back. We of course sported our festive green and enjoyed Irish stew, some beer in our new commemorative glasses, good music, and good company at the finish line festivities at the Stanley Park Pavilion. A good time was had by all indeed! After that, I am not sure what's in store. But I am hoping for a fall half marathon!